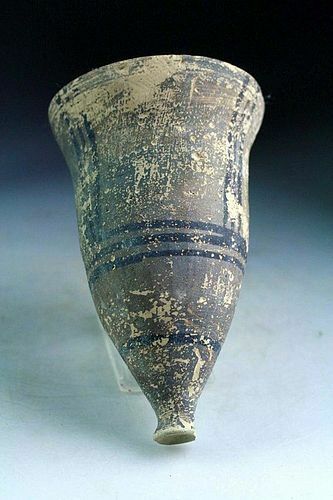 Interesting and very scarce pottery Chalice or goblet for drinking, Bactrian, 2nd. millenium BC. The Chalice measure some 150 mm. (5,9 inches) in height and is thus very impressive in hand. The cup is finely decorated with pigments. Condition: Choice, a minor chip to the footring and some typical wear to colours, othervise perfect.